Trash 1 card from HQ: All ice protecting this server has +2 strength until the end of the run. Use this ability only during a run on this server. Can the Corp use a Helheim Servers installed in the root of HQ if there is no ice protecting HQ? No. The effect does not have the potential to cause a change in the game state, so it cannot be used. My first impression of this card was negative, it didn't seem worth it to pay 2 and a card from HQ in order to boost the strength of ICE just a little bit for one run. And an annoying upgrade should only be counted on to last for one run in my book since the runner will generally want to trash it. However then I figured out one little detail: you can trash multiple cards from HQ to boost strength multiple times. Why is this so important? Because it allows you to set up a server with extremely nasty ice where the runner thinks they know what the ice is and think they have a safe plan to break all the nastiness only to be confronted with much stronger ice. Yes, the runner can jack out (unless Whirlpool and An Offer You Can't Refuse are used) but some ice can simply bring the runner very close to death on their own such as the normally very weak Komainu. It would only take a little extra nudge (e.g. House of Knives) to flatline the runner. It's a good thing that influence on Helheim Servers is only 1 since as all the cards just mentioned are Jinteki. That's not to say that HB can't profit from Helheim either, just look at Brainstorm. Throwing away all the cards in your hand and 9 in order to reduce the runner's handsize to 0 is a good deal in almost any situation. 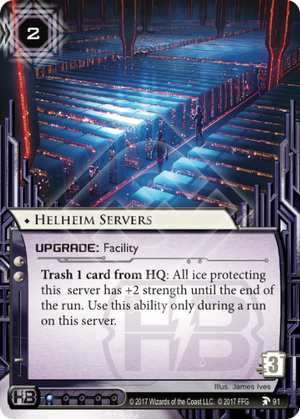 Helheim Servers can be used in a more straight plan as well, if the runner doesn't have too much credits it can boost the ice of a server high enough to keep the runner out for the remainder of a turn and score an agenda. That's generally a bit of a panic play but it could make the difference between win and loss. Whether the possibility of using it in that way is worth including it... I'm skeptical. Because Helheim seems to work best in a trap situation I expect it to be mostly used in decks built around it, but in such decks it could be very nasty indeed.